The Kusawa is a wilderness river flowing from Goodwin Lake, a small lake in the alpine near Haines Pass, north to Kusawa Lake. 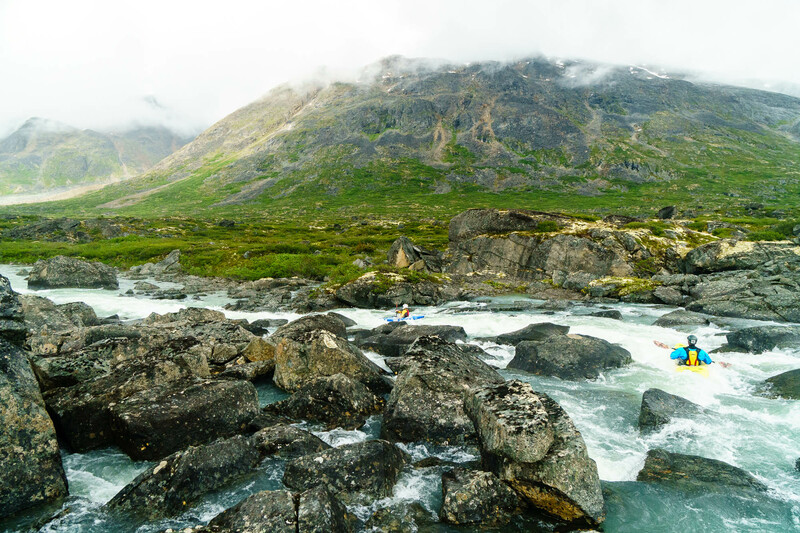 The whitewater is decent and the scenery is unparalleled — the river starts well above tree-line and you paddle through a unique alpine valley as you descend towards Kusawa Lake. The remote nature of the Kusawa makes it tough, but as far as wilderness float-plane access rivers go, it’s pretty straightforward. It’s close enough to Whitehorse that you can fly directly from town to the put-in. There are a couple different companies; we had a good experience with Alpine Aviation. Taking out is a bit more complicated. The river flows into Kusawa Lake, a stunning blue lake sandwiched in a narrow valley between huge mountains. Appropriately, “Kusawa” means “long, narrow lake.” Kusawa Lake is as long as it is beautiful, and the only road access is on the far (north) end from the mouth of the river. 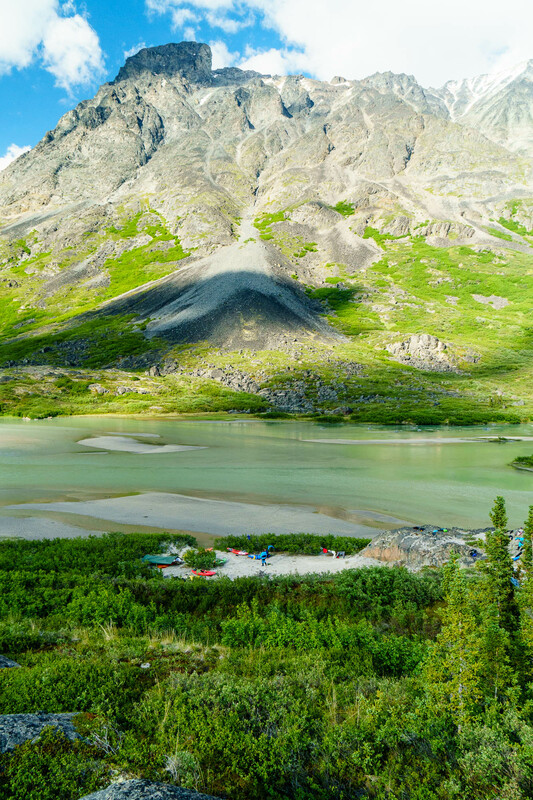 You can drive to Kusawa Lake Campground from Whitehorse in about two hours, but paddling across the lake (~70km) would add at least one long day of flatwater to your trip, probably two. The best options are to arrange a boat pickup from the south end of the lake or book a float plane ride back to Whitehorse. Boat pickup is OK, but I’d only recommend it if you can find a large enough boat that the kayakers can all go on board. Towing behind a small motorboat for that distance is not pleasant. Depending on your group size, it might end up being similarly expensive and far more convenient to book a floatplane flight back to Whitehorse. For reference, our cost per person for a group of six including flight in, budget boat-ride out, and shuttle from the campground back to Whitehorse was $570 CDN. 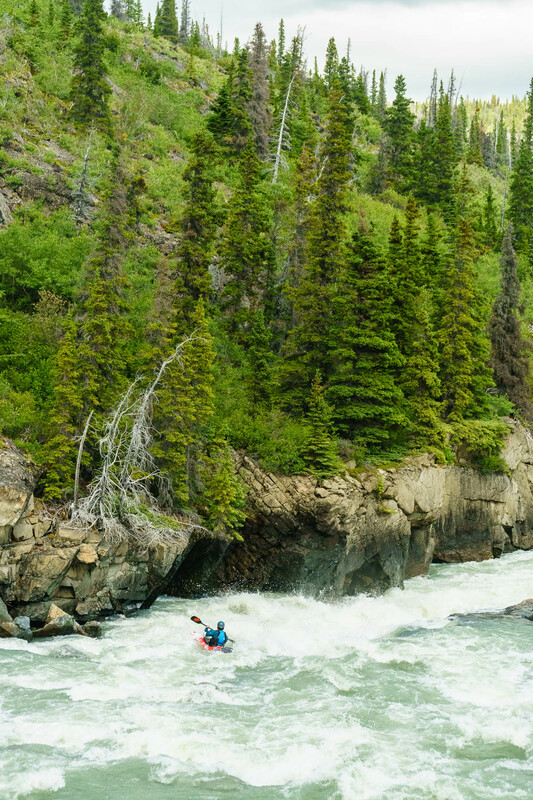 This is the Yukon, there are no permits and there are no rules. In all seriousness, this valley is quite pristine and the river itself has only been paddled a handful of times. If you have fires once you’re below tree-line, be very careful, and do your best to practice Leave No Trace principles. The Kusawa starts as a meandering alpine stream flowing directly out from Goodwin Lake. The first day’s whitewater is low volume but incredibly unique — the river hasn’t really eroded into the landscape at all. You float between (and through) big granite boulders left by the last glaciation, paddling the occasional class III and IV rapid. The first two bigger rapids are obvious; one is runnable but junky. The other is a great looking cascade that unfortunately ends in a river-wide sieve fence. It may be runnable at higher flows. A typical day one scene — fun class III boogie and a unique alpine riverbed surrounded by mountains. The river slowly picks up volume as you course your way through the alpine. There are a few “lake” sections, but current is decent throughout. We identified 11 major rapids on Google Earth before the trip; many of these turned out to be portages, but there are a couple high quality class Vs. There’s also quite a bit of good class IV paddling, especially in the second half of the trip. All the major rapids are fairly obvious from river-level and portaging is easy. Even the longest major rapid only takes ~15-20 minutes to portage with loaded boats. Great camping is available throughout; we camped on small lakes in the alpine for two nights and found a nice open forest near the end of the river on our third night. Give yourself some time and go for a few hikes! The camping is very good. You could avoid the float plane trip by doing this river with packrafts. Hiking in to Goodwin Lake from Kelsall Lake (at Haines Pass) or up and over from the Blanchard both seem like decent options. Whitewater-wise, I wouldn’t do this unless you’re an experienced class IV paddler, but given that, packrafts would handle most of the whitewater just fine and would be easy to portage around the bigger stuff. You’d still have to deal with the lake at the end, but you could at least save the flight in, and you might be able to get creative on the lake-end of things as well. We paddled the river in mid-July 2018. Levels were fine — low for the first half and pleasant for the bottom. Higher water would not hurt, so it might be worth trying earlier in the summer (maybe in June), but it doesn’t seem like the river ever gets all that high. I wouldn’t go much later than we did. This isn’t a super heavily trafficked bear corridor, but it is definitely grizzly country. 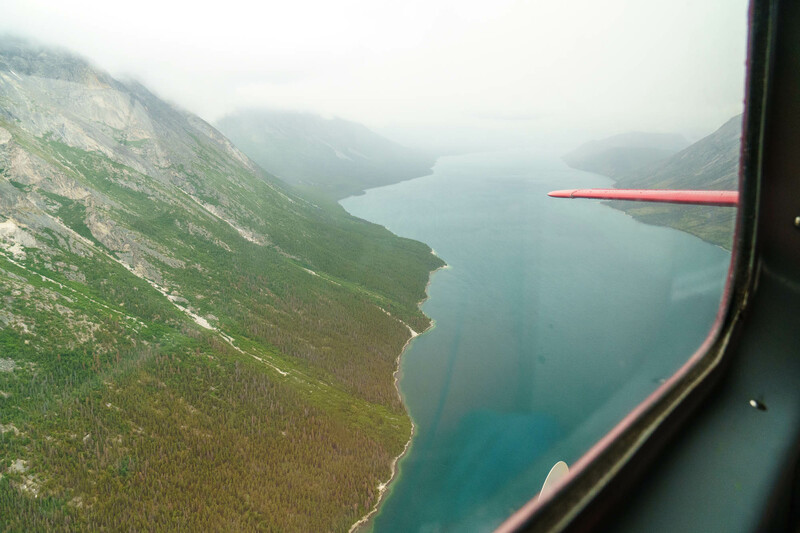 Bring bear spray (make sure to tell the float plane carrier that you have it) and practice bear-safe camping. Also, bring a bug net. A fun and powerful rapid above a shallow waterfall.